When every employee is happy, energised, and connected to a shared purpose—the benefits to your business multiply. 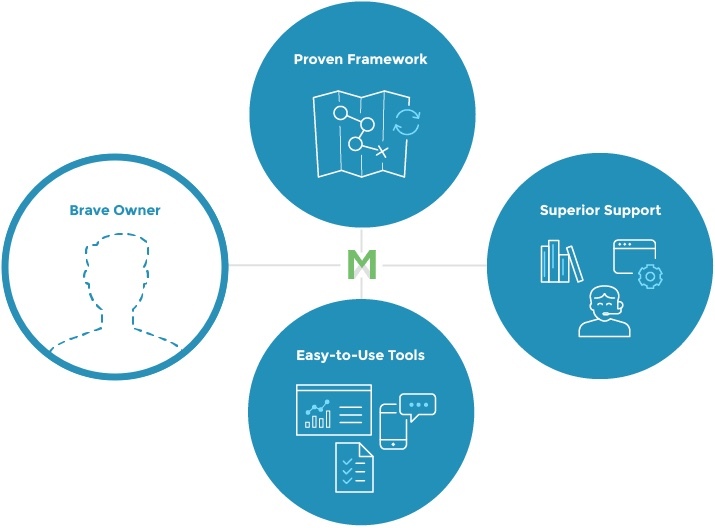 With simple employee retention tools and a strategic framework, our software removes the complexity that so many entrepreneurs face with improving culture, retention, and morale. But this only works when there are decision makers in place who care about their people, are open to knowing the truth, and empowered to continuously improve. Engaged Organisations start with brave, caring owners who are hungry for change and are eager to get started. Being open to the truth and willing to listen takes courage, but it’s an important first step towards transformation and increasing engagement. See progress and impact immediately. From purpose statements to quarterly survey cycles to team participation, it’s a structure that uncovers hidden truths, gets everyone on the same page, and forges solid bonds and commitments. Our quarterly anonymous employee survey gives your people a voice, and the interactive dashboard provides you with measurable results and concrete insights to move forward. Personal reports and action items create shared accountability. You’re not alone in your journey toward improving employee engagement in your organisation—we’re with you at every step. Our dedicated Engagement Specialists and library of resources ensure you get the most out of every phase of the program. Unengaged employees are disconnected, lack enthusiasm and energy, and deliver poor customer service. When direct interactions with customers suffer, so does your business. Employees that don’t feel empowered to develop professionally will find those opportunities elsewhere. Hiring, onboarding, and training costs increase, and morale usually takes a hit as well. Millennials in particular show up for jobs where they feel like they have meaning and direction. If those things are missing, things like attendance and safety record suffer. Organisations that don’t give clear expectations or hold people accountable see productivity flatline or decline. When everyone has different goals and are moving in different directions, inefficiency runs rampant. Quick, mobile-friendly surveys deliver truly honest feedback from everyone in your organisation. Employee responses aren’t associated with individuals, so feedback is always eye-opening and inspiring. Scheduled every 90 days, survey cycles measure progress with enough time to take action in between. Your command centre to see feedback and engagement scores, actionable insights, and to share reports. Personal reports for each employee let them compare their scores to company averages and track progress. 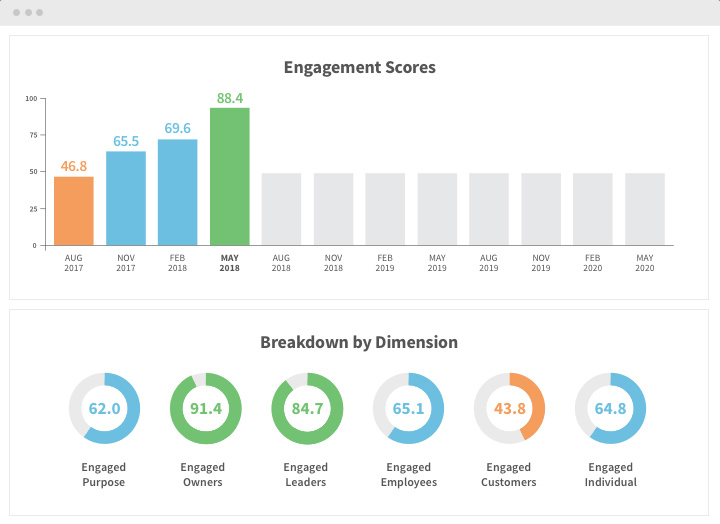 Compare engagement metrics and data by department, location, or any other way you want to segment. Built-in sharing lets you communicate goals and action plans appropriately across your team. Create your own custom survey questions to explore deeper issues more specific to your organisation. Try the engagement program out for yourself with a FREE report, and see how it can transform your business into an engaged organisation.